Best Tax Saving investment options: In whose name can they be invested? You are here: Home / Tax Planning / Tax Saving investment options u/s 80c : In whose name can they be invested? This is that time of the financial year when most of the individuals (considering the salaried individuals have to submit their income tax investment proofs) look for Tax Saving investment options. Generally, most of the employers accept investment proofs from their employees during November to February. The number of page-views or visits on my articles, ‘best tax saving ELSS mutual funds’ & ‘List of Income Tax Deductions’ have been steadily increasing over the last two weeks 🙂 and they are the most visited posts on ReLakhs. This trend indicates that people are searching for the best tax saving options on the Web. It is advisable to plan your taxes from the beginning of the financial year (April) itself. But better late than never! You still have 5 more months in this financial year. So, don’t wait till March to plan your taxes. You may end up saving or investing in unwanted investment options. I am sure most of you are aware of different types of tax saving instruments and also the list of income tax deductions which can be claimed under different Sections of the Income Tax Act. 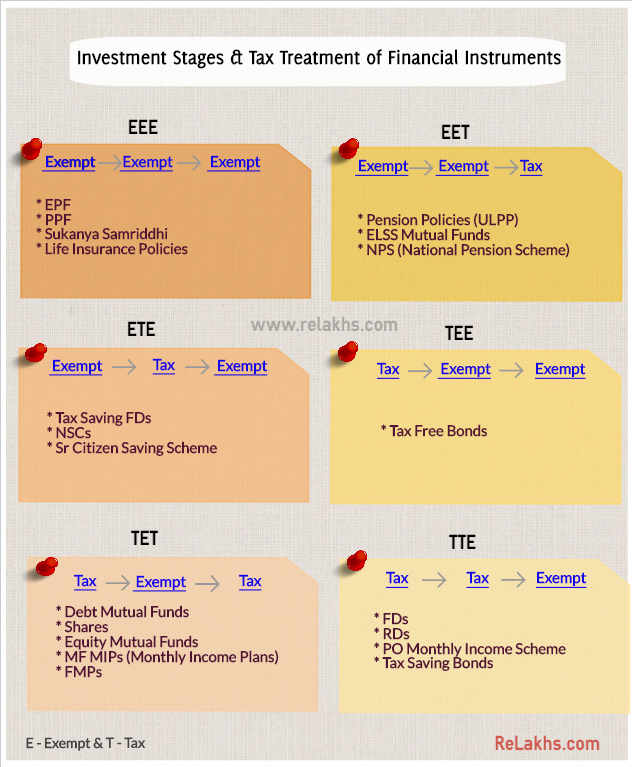 In this post let us discuss – In whose name these tax saving investments can be done under Section 80C? If you make investments in your spouse’ name or your child’s name, are these investments eligible to be claimed as income tax benefit? Tax Saving investment options under Section 80C : In whose name can they be invested? You can invest in PPF in your name. You can open only one PPF account in your name. You can also open PPF accounts in name of your spouse or children. However, kindly note that parents (father/mother) cannot open two separate PPF accounts in the name of same child. If you invest in name of your spouse, due to clubbing of income your need to add the interest earned on spouse’s PPF account to your income. You can also invest in your Major child’s name. For example : You can invest up to Rs 3 Lakh in two PPF accounts (self Rs 1.5 Lakh + major child PPF A/c Rs 1.5 lakh). You can claim tax deduction of Rs 1.5 Lakh. If the major child has taxable income, he/she can treat the other Rs 1.5 lakh as gift and can claim tax deduction on his income. PPF account cannot be jointly held. The premium amount paid by a policyholder towards life insurance premium for self, spouse or his/her children can be claimed as tax deduction. If you pay life insurance premium on policies which are in name of parents, brothers, sisters or In-laws then such amounts are not eligible to claim u/s 80C. Kindly note that section 80c deduction is available on Life insurance premium paid for adult children or married daughter too. If you are paying premium for more than one life insurance policy, you can club all the premiums and claim the total amount u/s 80c. Contributions to Employees Provident Fund (EPF) or Voluntary Provident Fund (VPF) in your name alone can be claimed. NSC (National Savings Certificate) investments which are in your name can be claimed. ELSS Tax saving mutual fund Schemes : Investments in ELSS funds which are in your name alone can be claimed as tax deduction. ELSS funds can be held in joint-names, but only first-applicant (primary holder) who is a tax-assessee can claim the tax deduction. If the parents make an investment in the child’s name in any of the specific investments under Section 80C such as Equity Linked Savings Scheme (ELSS) or PPF, the parents get the tax benefit and the taxable income gets reduced by the amount invested. The parents can, however, claim a deduction of up to Rs 1.5 lakh under Section 80C – of his own and his child’s combined. Tax Saving Fixed Deposits: Same as in case of ELSS investments. The contributions have to be made by parent / guardian of a girl child. Girl child is the beneficiary under SSA Scheme. The contributor (parent) can claim the tax deduction on the contributions made to SSA account. A depositor can open and operate only one account in the name of same girl child under this scheme. The depositor (or) guardian can open only two SSA accounts. The investments have to be in your name for claiming tax deduction. Joint account can also be opened. But it has to be only with the spouse. There is no age limit for the second applicant. In case of joint accounts, the primary account holder is deemed to be the investor. So, only the first applicant can claim the tax deductions. You can open multiple SCSS accounts, either individually or with a joint investor (must be the spouse of the primary investor). NPS (National Pension System) – only the NPS subscriber can claim tax benefits. If you invest in NPS which is in your spouse’s name then you cannot claim tax deduction. I INVESTED Rs.100000/- IN LIC SAMRIDHI PLUS SINGLE PREMIUM SCHEME ON 06.05.2011 FOR TEN YEARS SCHEME MATURITY ON 06.05.2021 , DURING THE MONTH OF SEPTEMBER 2018 I REPURCHASED/EN-CASHED MY LIC SAMIRIDHI PLUS. LIC PAID ME PRINCIPLE PLUS INCREASE IN UNIT VALUE CREDITED DIRECTLY THROUGH RTGS RS. 1,93,369/- TO MY SB A/C WITHOUT ANY DETAILS. WHEN I CONTACTED THE LIC OFFICER AT BRANCH THEY TOLD ME DEDUCT THE PRINCIPAL AMOUNT i.e.Rs.1,00,000/- IN FILLING THE INCOME TAX RETURN. I AM INDIVIDUAL . LIC OFFICER HAS ALSO GIVEN ME STATEMENT WHERE IN IT SHOWN THAT RS.1,00,000/- INVESTED IN LIC SAMARIDHI PLUS AS TOTAL INCOME WAS Rs,1,93,369/- WAS PAID TO HIM.THAT FULL & DEDUCTED 1% TDS ON FULL AMOUNT i.e.rs.1,934/- .SIR, AMOUNT SHOWN IN 26AS RS.1,93,369/- PLUS RS. 1,934/- WAS SHOWN TDS IN 26AS. KINDLY REPLY THE QUARRY AT THE EARLIEST I AM YOUR OLD CUSTOMER & REGULARLY WATCHING ON LINE. I have replied to your query at this link..
Is there a provision that I support my major son for a PPF A/c as PROPOSER to claim IT exemption under any section, besides me claiming for myself U/s 80 C, me being senior citizen. May I know, what do you mean by Proposer here? 1) I am a salaried person and if i invest in some financial instrument for eg. in FDs or Mutual Funds on my Spouse’s name (I will transfer money from my bank account to my Wife’s bank account and would then invest in FD or MF on my wife’s name), then am i liable to pay tax on the interest amount earned on these FD’s or would my Wife liable to pay tax on these. 2) If i transfer money from my bank account to my mother’s bank account and then from my mother’s bank account to my wife’s bank account and then finally i invest this amount in some bank FD on my wife’s name, then how would be the tax treatment for the interest earned on this FD. 1 – You will be liable to pay taxes on taxable income. Clubbing of income provisions apply here. 2 – Kindly note that rules of clubbing of income comes into picture if you gift a certain amount to your spouse, or minor children or Son’s wife. Any income earned by the recipient on the gift shall be clubbed with the income of donor. I am planning to invest ELSS in my spouse name. As she is a home maker, she doesn’t have any income. Can i show that in my tax deduction ? No, only she can claim tax deduction as the investment is going to be in her name. I have invested in SSY from my account. Can my husband show that amount under 80C? I believe that only you can claim the tax benefit as you are making the contributions. Dear sankar ..Kindly go through : List of income tax exemptions for FY 2017-18.
kindly have in touch for the tax planning and the various source of investing and reduce the tax. this is the first time I have landed to your site. I must compliment you for such an informative article. Hi Sreekanth , Will you please let me know that Stamp Duty can still be claimed as tax deduction under 80c in FY2016-17 ? Yes, this provision is still available. Kindly note that this is not applicable for an ‘under-construction property’. Also, the property should be a new residential property and not a resold one. can you pl clarify this. We made FD around 5 lakhs as individual deposit of 50 K Rs each to avoid tax from our house hold savings and land sales 15 years before. Also, 10 lakhs received from overseas to our account from my children. Once FD matured in the end of each year , we with drawn the cash and made another FD by adding some more cash . Now the total became 25 lakhs and the Interest is crossed TAX limit. If we return ITR, shall we have to provide the source of the deposits when return ITR. Pl note we do not have any proof for them since it is very long back. Also, we are senior citizens. Please advise. Kindly file your ITR for AY 2017-18 without fail. If you receive any compliance notice, you have to prove the sources of income for this investment. Kindly take help of a CA in case you get notice. and He is working in Software company and he can see all the things on Incometax return website. 1.Now he wants to have a printed proofs of all the years including years, which he lost while changing his rented house from the web site. 2. He is employee of one of the noted SW company, he has aadhar,PAN, TDS certificates and but he has lost few years paper proofs. 3. What is the ultimate proof whether it is paper/online proof that he has returned incometax for all the years which he came under incometax slab. he wants to apply for home loan for that he has to produce all years. ( around 7-8 years) IT return proof, how he can do this at one shot. You mean let me go to IT returns gov website and let m download the softcopies, you means to say. Let him go to web site and download all the proofs.right ? OR he can provide PAN number to bank and let them check it. Your friend would have received the ITR Intimations u/s 143 to his Email-Id (if provided). He can consider them as ITR proofs. In case, the emails have been deleted. He can still raise a request on e-Filing Portal. The income tax e-filing portal has an option to send request for the demand notice sent earlier by email to your registered email id (if the returns are filed electronically). This option is available under ‘My Account’ and then click on ‘ Request for Intimation u/s 143(1)/154’. It is a decent option. But till the time RBI comes up with guidelines, advisable to stay away. I Have query on your below point on PPF. PPF interest is tax free in spouse hand. Still clubbing will come to picture, if husband transfers the money to house wife’s saving account and wife invest that in her PPF account for her old age need ?? If, still clubbing will come to picture, when to do that, when PPF account will mature or each year? I am taking specifically where total 3 Lakh invested in both PPF accounts. I know not a good idea to invest 3 Lakh in PPF. In such a scenario, advisable to show the ‘interest earned’ on wife’s or child’s PPF account(s) as ‘Exempt income’ when filing income tax return. This is quite useful, Sreekanth. Many times, investors are confused about this aspect. Good to have information captured for multiple products at one place.